The concept of the accessible home has evolved beyond the basic grab bars and ramps to one in which accessibility is built into the basic design. Universal design makes living in a home easier for people of all ages and abilities. Accessible home remodeling for the disabled can be both beautiful and functional and never needs to have any institutional appearance. As our aging baby boomer population ages, the need for accessibility remodeling in the home is becoming ever more important. Our new way of viewing the basic home in our society and our antiquated architecture is giving way to a revolution in home design. Ordinary homeowners with extraordinary challenges can partner up with CAPS design professionals, architects, and their own families to create homes to restore capabilities, independence, and grace to daily living. Fortunately there is home accessibility help in Austin, Texas for our veterans. Everyone ages differently and has different needs and wants. The factors that constitute the aging in place market for all individuals are based on a persons genetic makeup, their lifestyle including the choices they have made while living their life, and their environment. These factors have brought about the need for universal design. This is the design of products, services, and environments that are usable by as many people as possible regardless of age, ability, or situation without the need for adaptation or specialized alterations. It provides for the greatest safety and access for any home guests or occupants and is undetectable when done well. Since so very few homes share the accessibility offered by universal design, to satisfy the needs of a particular household member brought about by an accident, an illness, or simply the aging process there will always be a need for customized accessibility features. This will be accomplished by a CAPS accredited remodeling professional producing a truly functional design when considering accessible home designs in Austin, Texas and disability access baths. T-Square Company is a competent home remodeling company who understands and practices aging in place home modifications in Austin. They are CAPS certified and will perform the work needed to fit their in house design insuring your safety and accessibility during a handicap remodeling project. 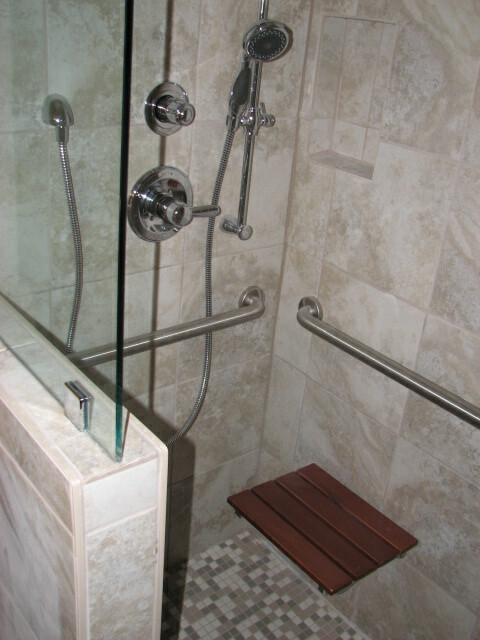 T-Square Company specializes in accessible bathrooms in Austin, Texas. Physical limitations affect many more people than the daily users of walkers and wheelchairs. Many members of our life experienced or elder society have significant problems in dealing with their home environment. Today's conventional building standards conflict with most people's accessibility when you consider our created architectural barriers concerning cabinetry and door opening widths, individual strength, range of motion, movement, manual dexterity, balance, and coordination. Once the demands of our built environment exceed their capacities we become excluded from a room or even the entire home bringing forth the need for elder construction and remodeling. The building world must work in unison to be sure the entire living environment meets basic needs in addition to affordability and structural integrity for the consumer and home owner. This includes both the home and the components within the home being accessible to all inhabitants. Privacy, sense of belonging, sense of control, and the sense of safety and security make up the quality of life for any home and should be considered for any design.